The New York Times recently profiled local efforts to include regional farmers in the Hunts Point Food Distribution Center, including GrowNYC's proposal to expand our Wholesale Greenmarket to include a Regional Food Hub that would provide valuable opportunity and space for more than 100 local farmers and producers. GrowNYC, the agency that runs a network of 57 retail green markets with 240 small-scale farmers, has proposed a $12 million center at or near the Hunts Point terminal. It would have indoor space providing refrigeration and storage for 80 farmers and space for complementary businesses like makers of local cheeses and preserves. The plan also envisions an outdoor site for an additional 50 farmers. Marcel Van Ooyen, the agency’s executive director, said that such a hub would allow farmers to set their own prices, sell directly to wholesale customers and keep more money in their pockets, just as the small farmers do. “We think this is a huge game changer,” he said. GrowNYC's Wholesale Greenmarket, located at the Fulton Fish Market in the Hunts Point Food Distribution Center in the Bronx, offers over 100 local and regional farm-fresh products including fruits, vegetables, herbs, plants, and flowers at competitive wholesale prices and quantities. Wholesale Greenmarket is open April to December, Tuesday - Saturday from 2:00 AM - 8:00 AM. For farmers in New York and surrounding states, heavy rain was the hallmark of the 2011 season. In many cases, the volume of rain proved disastrous. Grain producers in the Northeast faced a variety of challenges owing to the season’s wet weather, resulting in low yields, poor quality product, and reduced protein content. In Pennsylvania, Fusarium was the biggest culprit. Commonly known as wheat scab or head blight, Fusarium is a fungus, which is found in the ground and infects wheat when rain splashes soil onto plants. 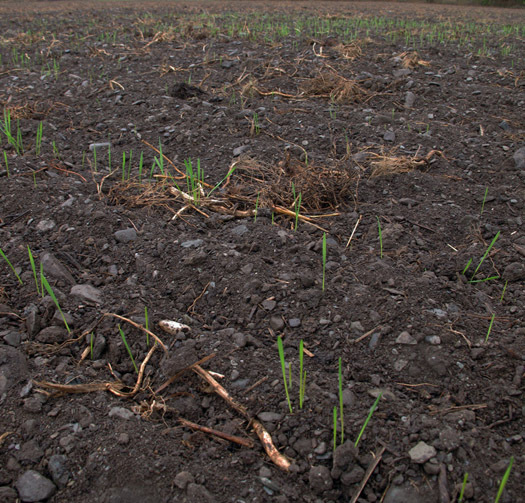 Winter wheat is especially susceptible, since it flowers earlier in the season, when rain is more likely. The later growing season in New York this year meant that producers there were largely spared from Fusarium. However, the wet season resulted in a different challenge for these farmers: low protein content. A typical winter wheat grown in the Northeast can have a protein content of around 11%. The 2011 season’s average was below 10%. This may be owing to reduced fertility; heavy rains washed much of the nitrogen that contributes to protein content out of the soil. Given the problems caused by the rainy season, the region’s farmers found a variety of ways to bring their products to the market. Crops infected with Fusarium could, in some instances, sell to outlets like distilleries, which process grains in such a way so that toxins are destroyed. Millers and bakers who could get their hands on high-protein spring wheat blended these with the lower-content winter wheat to create bread flours that met the needs of the region’s bakers. And farmers and millers continue working with bakers to find innovative uses for the diverse grains grown in the northeast. Despite the numerous challenges faced by grain farmers, hopes are high for a better season in 2012. While there isn’t much farmers can do about the weather, planting a greater variety of grains can help hedge against anomalies like excessive rain. 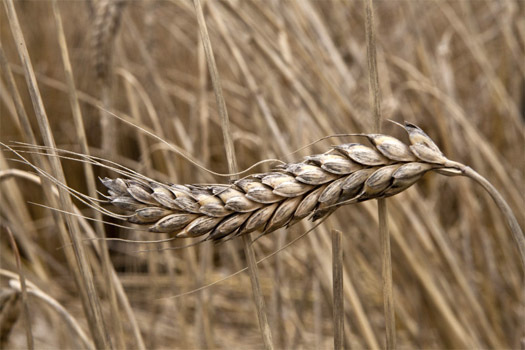 For instance, although winter wheat typically produces a higher yield, spring wheat has higher protein content and is more resistant to Fusarium. Increasing the acreage of spring wheat can help balance against issues that make winter varieties more vulnerable. Farmers can also plant more non-wheat grains as a way to diversify. Elizabeth Dyck, founder of the Organic Growers Research and Information-Sharing Network (OGRIN), explains that not a single food-grade grain is being grown in sufficient volume to meet market demand in the New York-Pennsylvania area. For example, there is burgeoning interest in locally-grown rye among the baker community and consumers. Organic brewers and distilleries in the region are seeking out a number of different grains as well. Other farmers and millers point out a similar growth in demand for regional grains. For instance, demand for high-quality bread flour means that hard red spring wheats, which are higher in protein and yield a better bread flour than lower-protein winter wheats, need to see more acres planted in the coming seasons. Emmer is another example of a grain whose supply hasn’t caught up to demand. Currently, the home baker can count on having access to the most diverse array of locally-grown grain products. Outlets like Brooklyn Kitchen carry some local flours and grains, and grain farmers and millers sell their product at several Greenmarket locations citywide. Meanwhile, some producers choose to limit their outreach to larger, wholesale customers until the local supply is sufficient to meet their demand. As the regional grain system continues to develop, organizations like OGRIN can help locate clean sources of seed, work with farmers to order sufficient volume, and give recommendations of good-quality and reliable varieties. Farmers and millers must also continue to find innovative new ways to ensure profitability of grain crops in years where weather jeopardizes quality. As bakers, restaurants, and individual consumers continue to discover regional grains, there will be a need for farmers to continue broadening their offerings to this expanding market. We've got a lot of stuff happening for Thanksgiving. Here's a quick summary: Greenmarket's Turkey Buying Guide Want to know where to buy a locally-raised turkey for Thanksgiving? Our guide gives you a rundown of farmers, prices, breeds, what Greenmarkets they'll be selling at, and when you can order and pick up your turkey. Read more. Holiday Schedule Changes Greenmarkets and textile recycling are affected by the holiday. Here's our updated schedule. Donate A Bag Our Thanksgiving Donate A Bag program was extremely successful last year, and it's back again this year. Greenmarket is partnering with local food rescue organizations to help feed New York City's hungry men, women, and children. Read more. Thanksgiving Produce Bags at La Marqueta Wholesale Greenmarket will be selling pre-packed bags of fresh, locally grown produce at La Marqueta's Clothing and Textile Recycling Day on Saturday, November 19th. Read more. Last Friday marked the opening of the 2011 season at the Wholesale Greenmarket. The restaurants, garden centers, landscapers, and everyday shoppers in attendance were thrilled to see the colorful offerings on display. Coming from as close as 15 minutes outside the city, our growers brought in an assortment of flowers, herbs, and shrubs to help city residents get a head start on their spring planting. Get more information about Wholesale Greenmarket. Monday – Saturday, 2:00 a.m. to 8:00 a.m.
On Saturday November 20th, GrowNYC's Wholesale Greenmarket, in partnership with participating schools, community organizations, churches and health advocates, will pilot a food distribution program in Harlem for the coming Thanksgiving holiday. Thanksgiving Produce Bags, filled with 5 pounds of fresh, local produce, including potatoes, onions, carrots, sweet potatoes, and collard greens, will be available for $4 at three main distribution sites in Harlem. EBT will be accepted. A downloadable flier for the event is available here. Additional locations will be announced shortly. For additional information please contact Mike Morris.